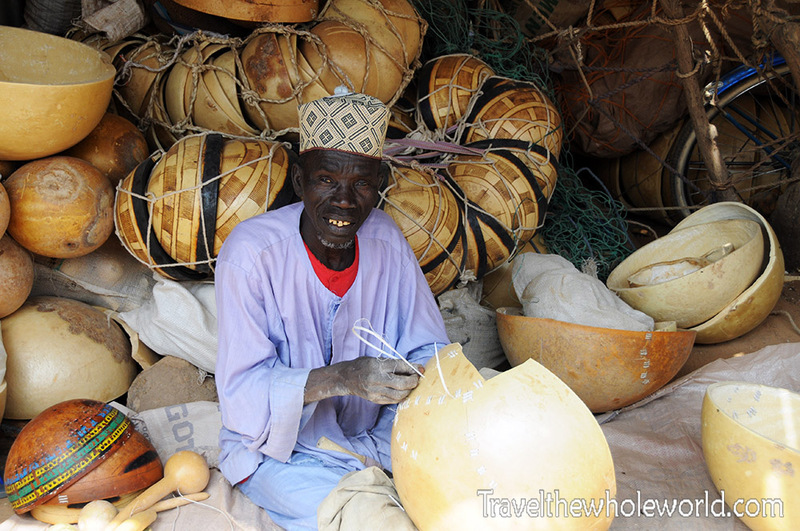 When I visited Niger, Zinder was my first stop after taking a bush taxi from Kano Nigeria. The half day ride was full of its own misadventures that ended with me arriving at night without any place to stay. I’ll get to that later, but for now I’ll do my first impressions on the city. 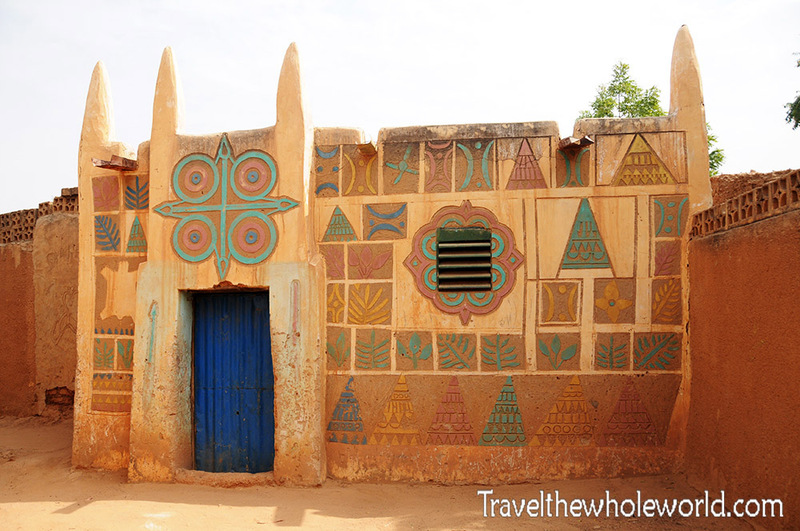 Zinder definitely looks like any simple African village you might imagine. 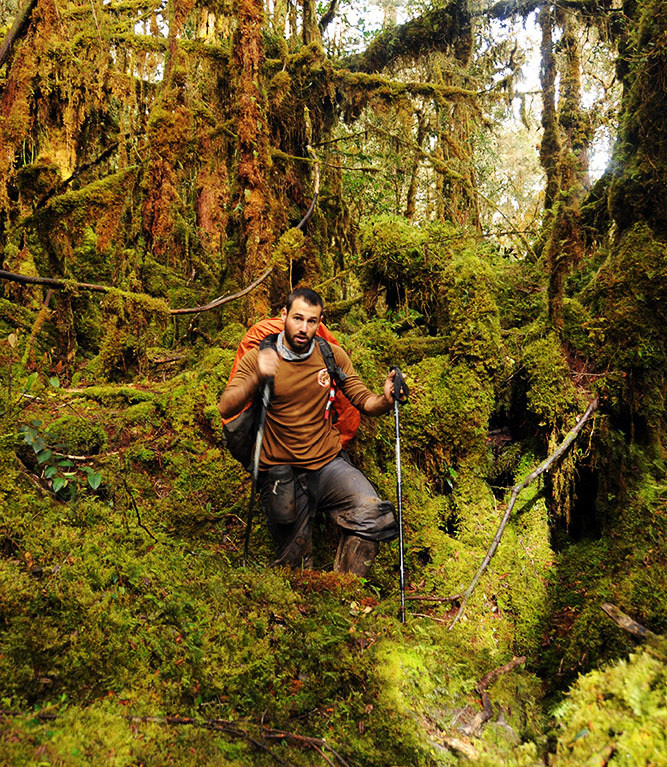 Life here for the most part is probably similar in many ways as it was hundreds of years ago. Of course there are cars and electricity, but for the most part construction is still make out of baked bricks, and pack animals do a lot of the heavy load carrying. 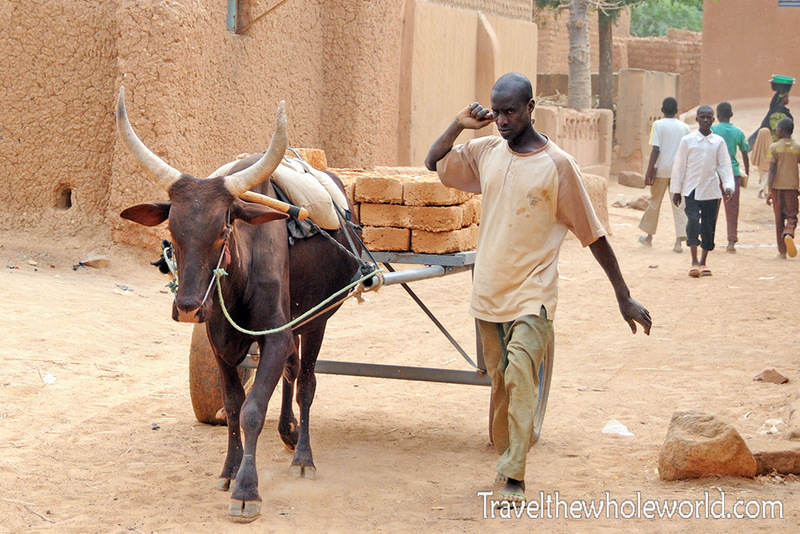 One of the first things I saw in Zinder was this bull above carrying a cart of baked bricks used to make new houses. 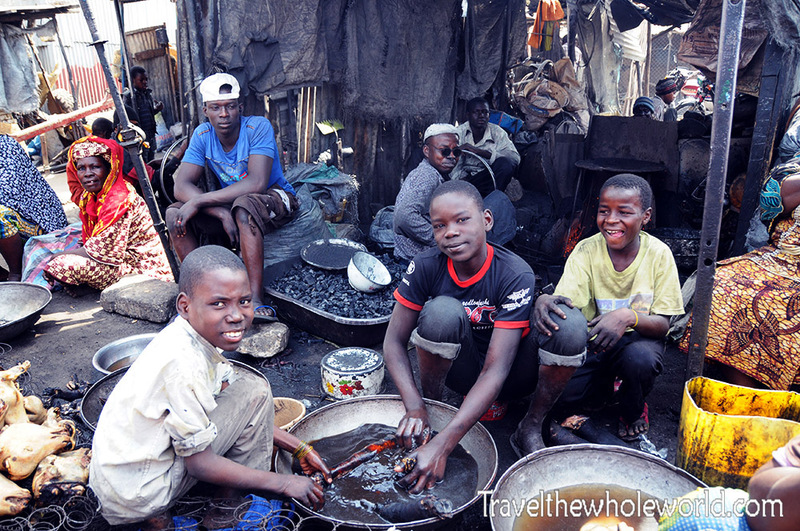 Just coming from Nigeria’s north, I naturally made lots of comparisons to my experiences there. In Kano, Nigeria I rarely saw women walking around in public without males. 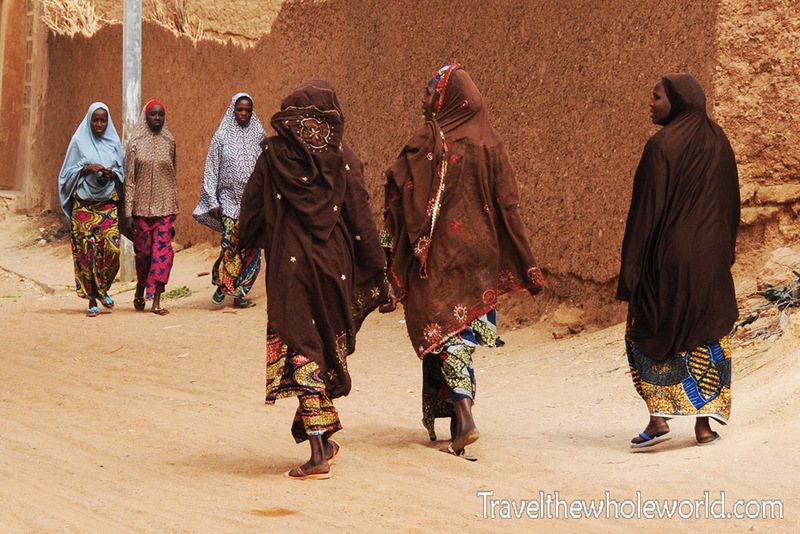 In Zinder it seemed that there were an equal number of women and men walking around. That’d lead me to believe that Zinder is a bit more liberal than Kano, which is only five hours south of here. Walking around the city was an interesting experience. Many of the locals weren’t shy at all unlike many other places I visited in Western Africa. 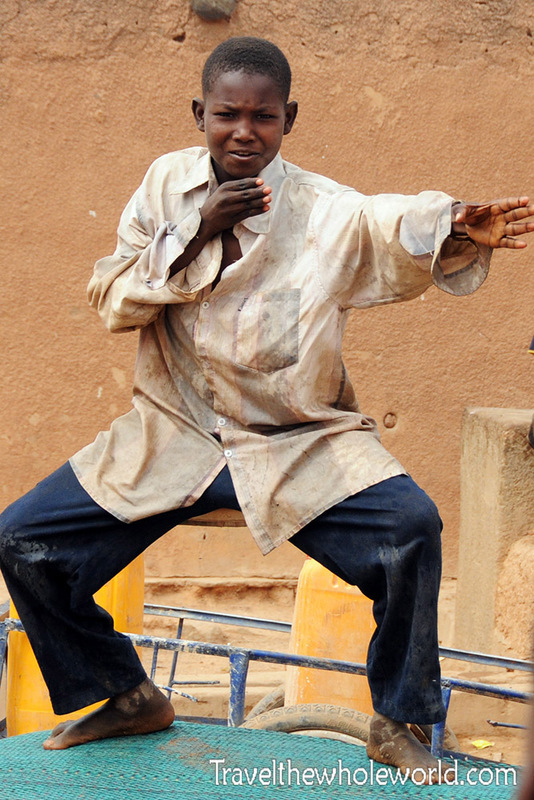 I’m not sure how this ninja boy above got inspired for martial arts, but he was very happy to show off his skills and poses for me. 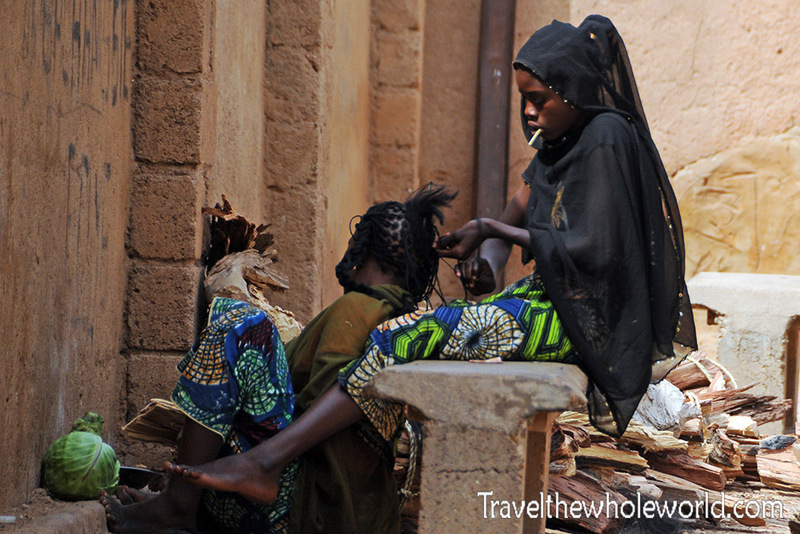 Below is a shot I took of two women who were braiding their hair off a small street. 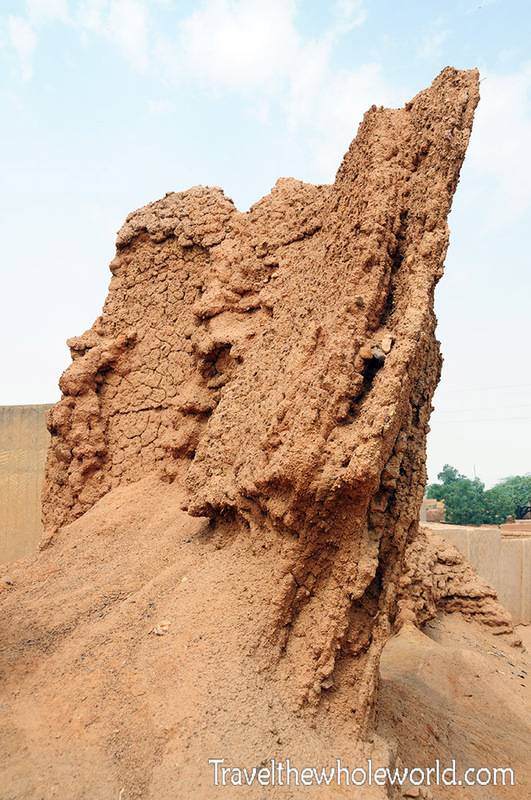 Like many ancient cities, Zinder’s city center was once protected by thick mud brick walls that have eroded away over time. Sadly not much is left, and the shot above is an example of what some of the remains look like. The mud walls here reminded of an ancient city in Afghanistan build by Alexander the Great that was in similar condition. Most of the city had ‘melted’ over the hundreds of years that passed. Despite the bad condition you can still get an idea of how massive these walls once were. 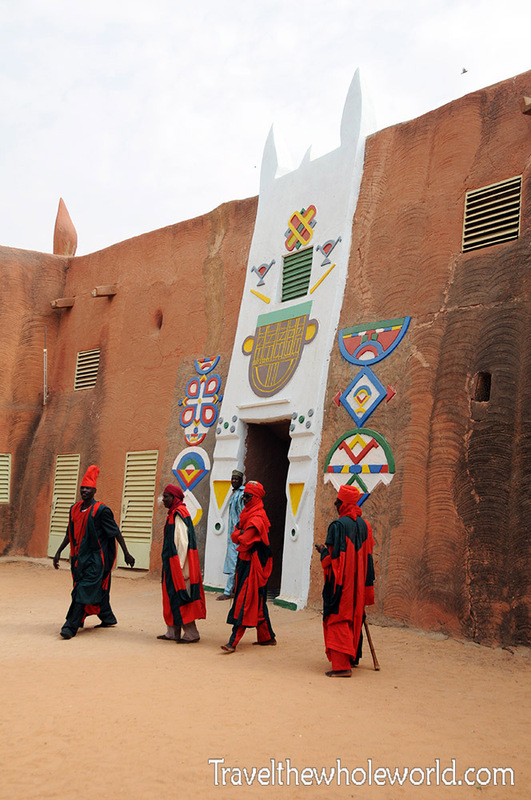 Niger is nearly 95% Muslim, with Christianity and Animism making up the remaining few percent. I heard there is at least one church some where in Zinder but I did not see it. 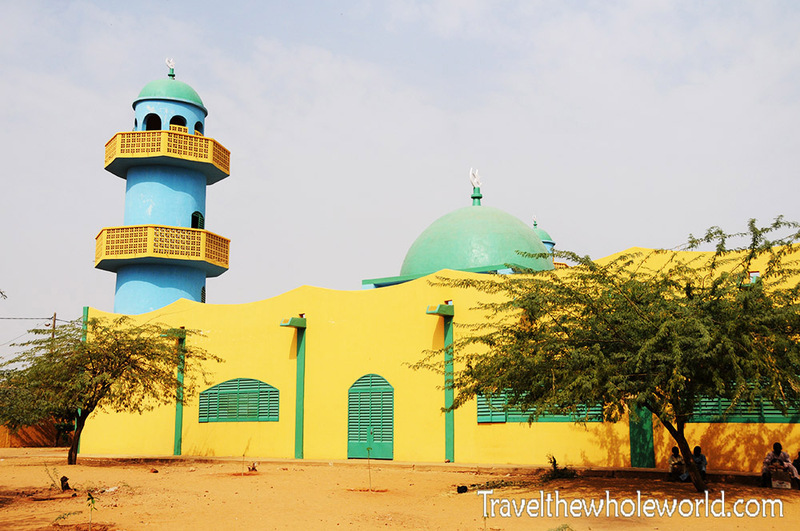 Otherwise there were lots of mosques and Islamic schools that I came across Photographed above is the Mosque of Zinder. Built during the colonial times, this colorful mosque was completed in 1722 and is the most important place of worship within the city. I happened to visit the mosque around prayer time and was invited inside. Below is a photograph of the prayer area of the mosque. 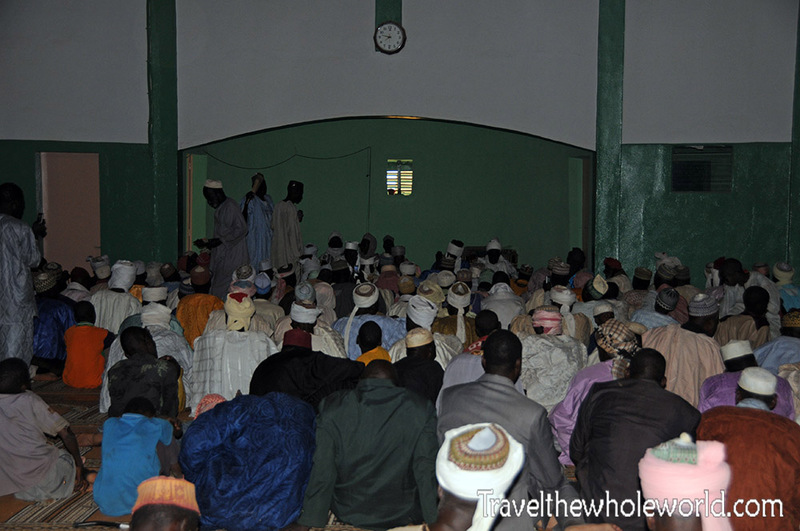 In another part of Zinder I was also invited into one of the Islamic schools. From what I could see the school seemed to be running without modern luxuries such as electricity or even printed books. Right outside the school was someone deep in prayer. 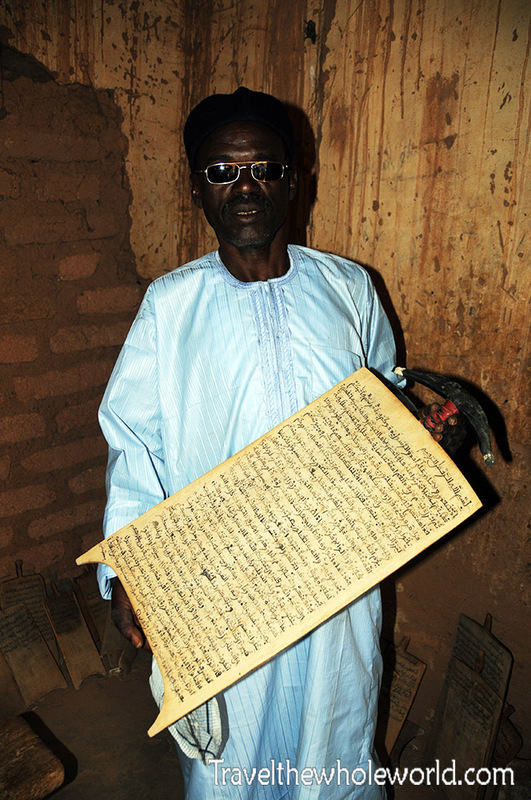 He was studying the Quran that was written on large tablets. Inside the school there were countless numbers of these tablets stacked up along the walls. One of the teachers was nice enough to hold one up for me. I almost skipped the market in Zinder since I had gone to so many in Nigeria, but fortunately I didn’t make that mistake. The market had a few unique items here such as the hand made baskets above. I’ve no idea how long it takes to make one of these but it’s clearly requires a lot of patience and skill. 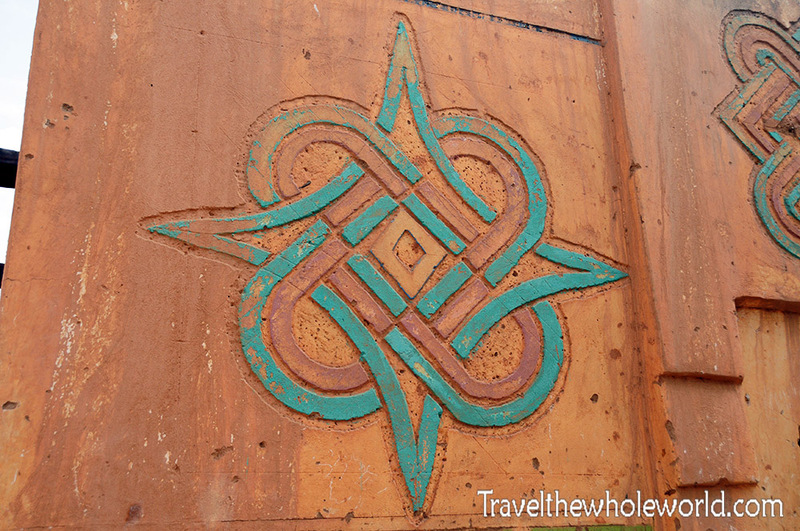 Unlike most other markets I’ve been to in Africa, this one had an enormous metal workshop. Many people were forging different metals without any kind of protection. In this area I also heard some extremely loud hammering that went on non stop. 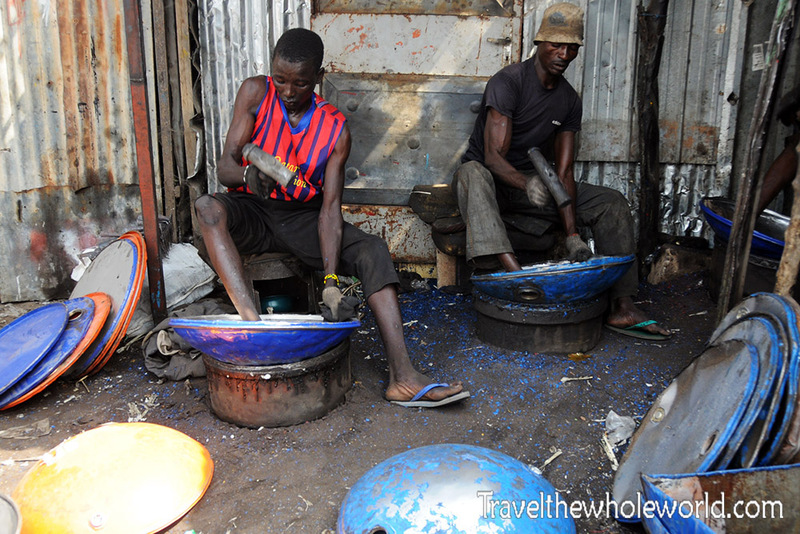 These two guys on the upper right were taking used fuel drum lids and hammering them away until they created smooth bowls. I have no idea how long it takes to make one but I can tell you it’s a slow process. While I watched they pounded away for several minutes and I saw no change on the lids they were working on. Some of their finished versions were surprisingly smooth. It’s an incredible amount of work for such a simple product and the loss of hearing these guys must be suffering! I’ve no idea what these kids are doing above, but they appear to be washing animal parts. By the color of the water I’m not sure how much washing they are actually achieving. Likely in the bowl they had dead goat parts. 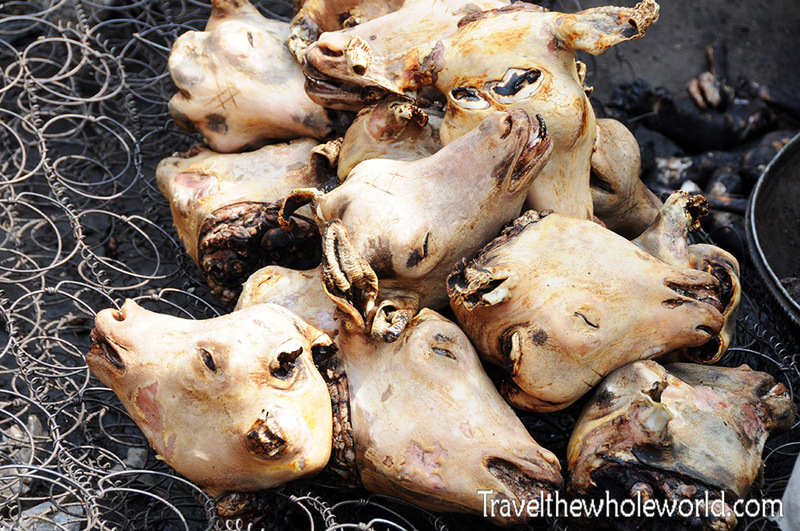 Right next to them was a morbid collection of fried goat heads on an old box spring mattress photographed below. I want to mention that the first night I arrived to Zinder, the place I intended to stay at had long since been closed. Since it was already night I ended up taking anything I could find. The room was relatively cheap but I certainly got what I paid for. The room was definitely not clean and the bathroom didn’t even have water or electricity. 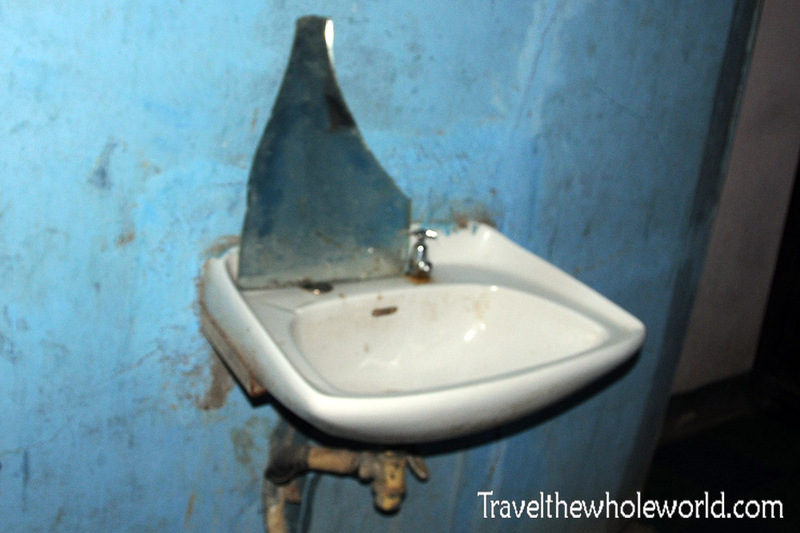 In order to get the photo of my amazing sink below, I had to use flash on my camera. The hotel also had a large bar that was full of locals who partied until 2am. When I was going back to my room I saw two guys taking in a veiled woman which I assume was a prostitute. One of them tried to talk to me in French and when I couldn’t speak back he simply smiled and gave me a thumbs on. The worst was yet to come though. Later on I could hear gigantic rats running around and in my half awake state I worried one might jump on my bed and pass on some nasty disease like rabies. While crawling out of bed in the morning I even cut myself on the bed post! 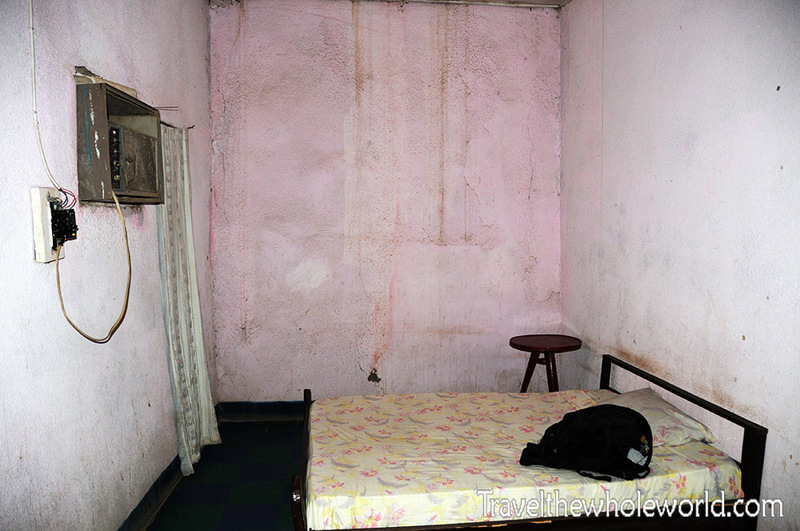 The next day I found a better hotel and locals there even told me the previous one was a dangerous place to stay. Some of the shops and restaurants weren’t much better off than the hotel I stayed in. This is a photo of a store that I went to to get some simple items. 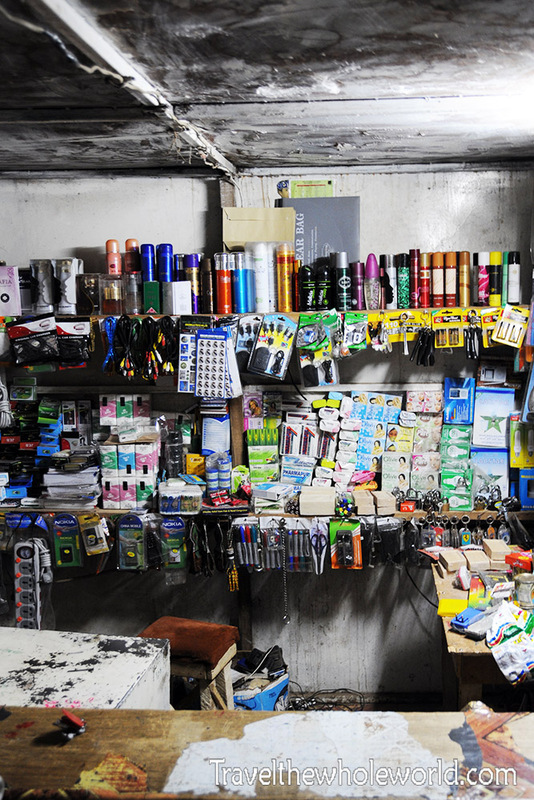 Despite the condition of the shop, like most people here the owner was extremely polite. 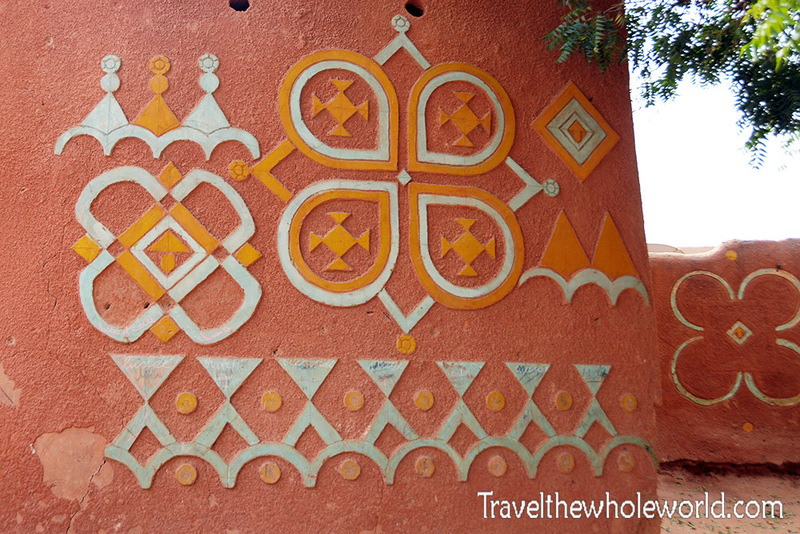 My main reason for visiting Zinder is because it’s considered the cultural capital of Niger. 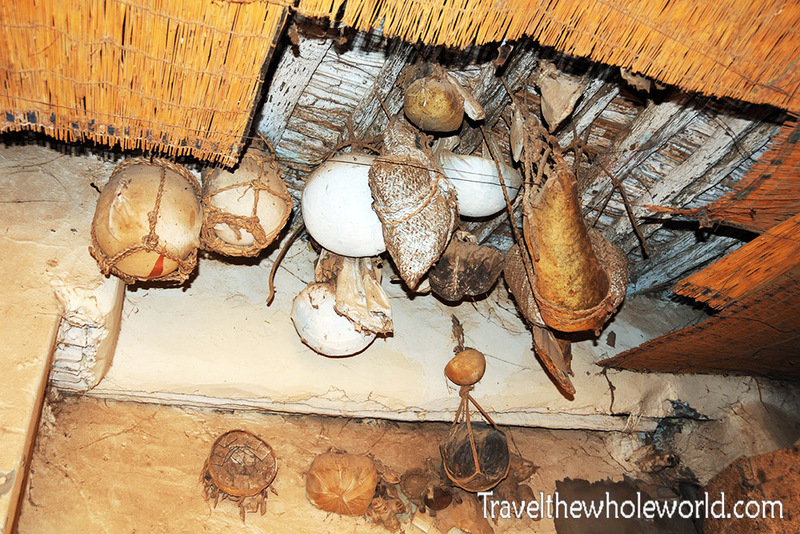 The city is known for some of its beautiful vernacular architecture and artistic designs. Photographed above and below are some of the more elegant homes in the city. 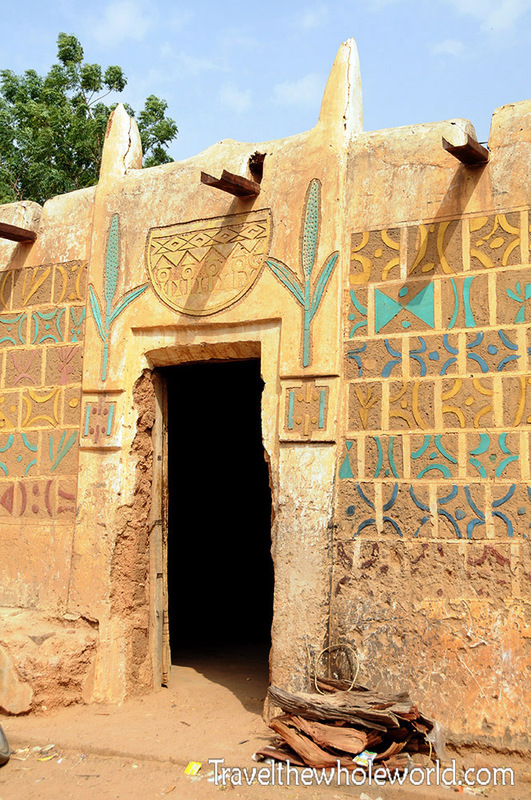 Built out of mud like many traditional homes in arid nations, those in Zinder took it a step further with their colorful decorations. 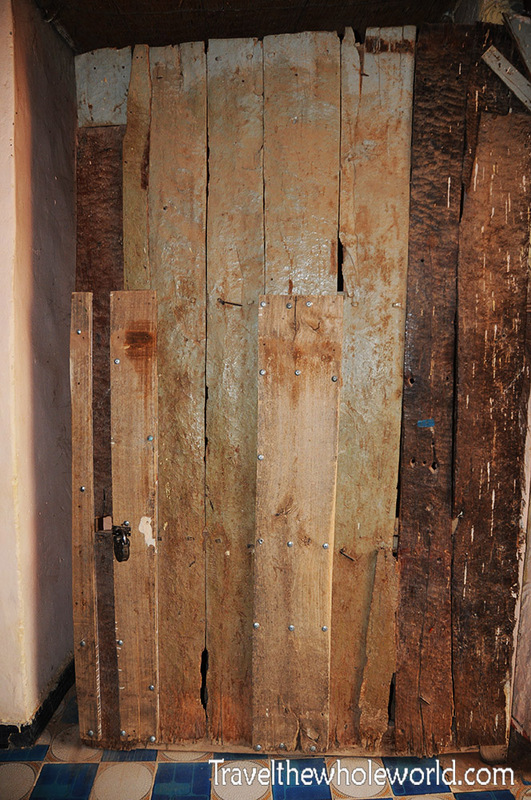 Above and below are some photographs of some of the details of the structures in Zinder. 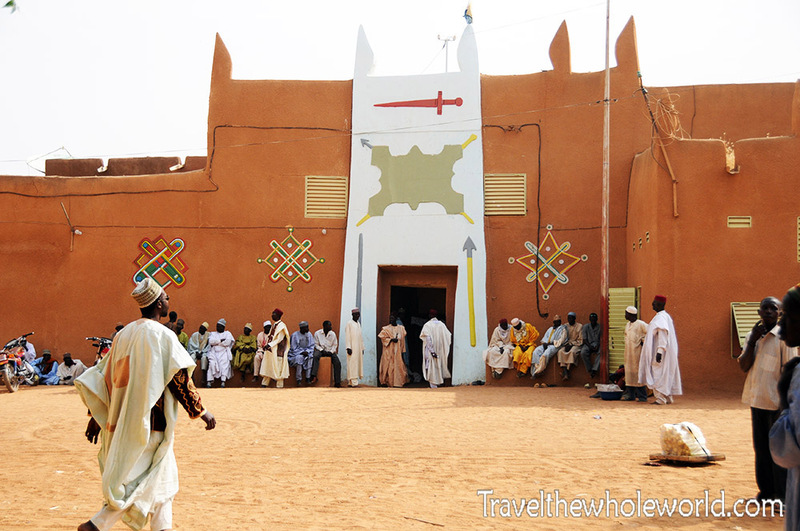 These structures are built by the local Hausa people, and though you can find this in other parts of Niger, Zinder has by far the biggest collection of them. 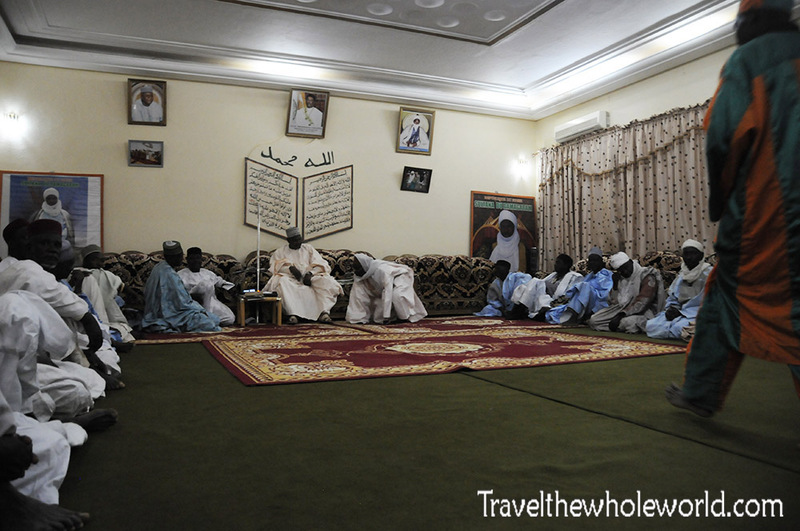 The most amazing place by far in Zinder is the Sultan’s Palace. Beyond hearing that this place existed I didn’t know anything else about it. To be honest I expected a small abandoned collection of buildings that had been converted to a museum. Instead I found the palace to be enormous and still in use today! Above is the main entrance to the palace’s guarded walls. The photo above shows myself with the palace security. After I entered I came across what I assume to be a TV crew from Niger making a film. Because we couldn’t communicate with each other they had me stand next to the reporters while they recorded themselves speaking for about several minutes and occasionally pointed at me. Hopefully it was all good things! After you enter the first main gate you’ll be asked to leave your shoes behind and will be barefoot the rest of the way. There is a second gate to enter that is guarded by more of the Sultan’s security officials. You can see they wear colorful red and black robes, but didn’t ever seem to be carrying weapons. I was taken through several rooms within the palace. Some were open hallways while others had ancient doors. Below you can see a photograph of one of the rooms where several items were hung from the ceiling. I was told that these were kept here not for storage but for some type of protection. At first I assumed there was some spiritual meaning for this, but more than likely they just meant protection from small animals! As I found out after arriving, not only is the palace still in use today but the sultan still even remains in power. Above is the sultan himself sitting in the center of the room. Each man who entered the room would face him and kneel down on the carpet before taking a seat. Since everyone else did it I followed as well. I would not expect the sultan to get many visitors, but he didn’t even seem to notice my presence in the room. I didn’t stay long with the sultan. I actually felt a bit awkward there sitting around for some event I wasn’t invited to. I’m not sure how he earns his money but he is definitely a wealthy man. My last shot of Zinder shows some of his people posing in front of the sultan’s limo.